A new paper on global macro-invasion dynamics led by Hanno Seebens, Franz Essl, and the GLONAF group has just come out in PNAS. 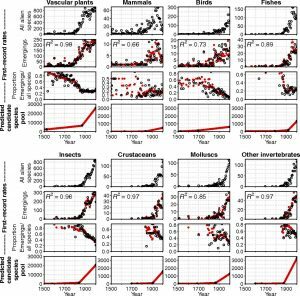 We were happy to contribute our GABI data on alien ant emergence and spread over time. Main punch line is that emergence of new invaders comes from expansion of trade networks and environmental change into new source pools and this keeps the rate of new emergence high. Check it out!